What happens if you and your family are involved in a serious accident caused by the negligence a driver who is not insured or does not have adequate insurance to cover your losses? Our North Carolina car accident attorneys have seen this happen far too often in serious injury accidents. In 2009, North Carolina law also made it mandatory for individuals to have uninsured motorist coverage (UM). This is coverage on your auto policy that protects you against some driver who has no insurance or if you are involved in a hit-and-run accident. The statutory minimum coverage for UM is 30/60/25. Underinsured motorist coverage (UIM) is coverage on your auto policy that applies when your injuries exceed the Bodily Injury limit of the at fault car, AND your Bodily Injury limit is higher than the at fault car. For example, if the person who caused your accident carries minimum liabiity limits ($30,000 per person, $60,000 per accident), but your injuries exceed $30,000, AND your liability limits are higher than the minimum, suchy as $50,000 per person, $100,000 per accident, you may file under your own UIM coverage for the difference. Coverage limits for UM/UIM benefits can be purchased for up to $1,000,000. Having uninsured and underinsured motorist coverage is the best way that families can protect themselves from negligent drivers who elect to operate a motor vehicle with no insurance or simply cannot afford to have anything other than minimum coverage. If you, a family member or a friend have been involved in an accident with an uninsured motorist or with someone whose liability limits were insufficient to cover your losses, you should seek the advice of an experienced North Carolina car accident attorney. Simply carrying UM/UIM coverage on your policy does not necessarily mean your insurance company will voluntarily pay the benefits to which you are entitled. Auger & Auger is a personal injury law firm that has devoted its practice to a wide array of personal injury matters, including representing clients who have UM/UIM claims. For over 40 years, the attorneys at Auger & Auger have distinguished themselves among the judiciary and their peers with their extensive background and experience in insurance law. For your convenience, we have five offices. We have three offices in Charlotte and one each in Greensboro and Raleigh. Contact us to schedule your appointment for a confidential consultation to discuss your particular case. Our cases are handled on a contingency basis, so that you will never owe our firm any fee unless we make a recovery for you. Our North Carolina car accident attorneys are familiar with the tragic results of collisions in Charlotte and around the state. Unfortunately, last week turned out to be a particularly deadly one. The North Carolina Highway Patrol investigated an accident that happened on Sunday, July 8, 2012, at 2:00 a.m. in Wake County, North Carolina. Three young people were headed home from a party, when the driver, Mark Kokus, 21, was going too fast and driving irresponsibly. He lost control and hit a tree, causing the vehicle to burst into flames killing Kokus and his two passengers, Marissa Blanks, 19, and Tyler Duncan, 20. On Friday, July 13, 2012 in Eden, North Carolina, police investigated a car accident that resulted in one death and four injuries. According to the officers, the collision occurred at the intersection of Meadow Road and Pierce Street around 3:30 p.m. Apparently, the driver of a GMC SUV, Durrell McLean, ran a red light striking a Pontiac being driven by Jerome Kenny. Kenny was pronounced dead at the scene. Also on Friday, July 13, 2012, at around 1:45 p.m. there was a fiery accident involving several vehicles and a tractor trailer rig on Interstate 85. North Carolina Highway Patrol investigated the accident that happened near Statesville Road on the north side of uptown Charlotte. One person, Deborah Suggs, 47, from Aurora, North Carolina was in the first car that was struck by the eighteen-wheeler. She died at the scene. On Sunday morning, July 15, 2012, an accident outside Wadesboro, North Carolina resulted in the death of a family of four. Investigation revealed that another vehicle hit them head-on, after crossing into their lane of traffic. The driver of the vehicle that was struck, Ryan Robinson, 41, his daughter, 15, and two grandchildren were pronounced dead at the scene. Finally, another head-on crash occurred at around 2:00 a.m. on July 16, 2012, on I-40 West in Wake County. Reportedly, Carolina Linares, 28, was driving the wrong way on I-40 West, without her lights on and traveling at 65 miles per hour when she struck a Ford minivan. Linares and a 17 year old passenger in the minivan, Joe Hernandez, died at the scene. The minivan driver, Nathaniel Hernandez, 21, was taken to the hospital in critical condition. Were the fatalities in the first accident the result of the driver being drunk and, if so, can it be established that the social host of the party served alcohol to the driver to the point of intoxication? Did the drivers of the vehicles causing the accidents have liability insurance, or adequate insurance, to cover the losses sustained? There could be possible uninsured or underinsured motorist claims, if the responsible party had no insurance or inadequate limits of liability. North Carolina requires only that motorists have 30/60/25 liability limits. This means the maximum amount payable under their policy is $30,000 per person, $60,000 per accident and $25,000 for property damage. Where had the wrong-way driver on I-40 been drinking prior to the accident? A potential cause of action called a Dram-Shop case may exist against the bar that served her to the point of intoxication. If you, a family member or a friend have been injured or suffered the loss of a loved one as a result of a car accident, you ought to seek the advice of an established and experienced car accident attorney. At Auger & Auger, our attorneys have over 40 years of experience in handling car accidents and other serious personal injury cases. Along with our dedicated staff, we can help you through these tough times by conducting our own investigation into what caused the accident, dealing with the insurance company and maximizing the recovery you are entitled to. Contact us to schedule a confidential, no obligation consultation to discuss your particular case. We have five offices that are conveniently located in Charlotte (3), Raleigh (1) and Greensboro (1). Our cases are handled on a contingency basis, so you will never owe us a fee unless we make a monetary recovery for you. Bicycle riding is great fun and exercise but our experienced North Carolina bicycle accident attorneys know the hazards of riding on roadways. Cyclists, who have little protection, will invariably come out the losers in collisions with cars or trucks. The injuries sustained can vary from only minor cuts and bruises to broken bones, head injuries or even death. Such a tragedy occurred at 2:15 in the afternoon on the Fourth of July in Raleigh, North Carolina. Steven L. Jordan, 49, the Director of North Carolina’s Mental Health Division, was riding his bicycle in the right hand lane of U.S. Highway 401. He was struck from behind by a logging truck near the intersection of North Louisburg Road and Perry Creek Road. Both were traveling northbound on Louisburg, when the truck attempted to pass the cyclist. Apparently the trucker failed to move over enough, because his truck or trailer struck Jordan from behind. He died from injuries at the scene of the collision. The driver of the logging truck, owned by Creech’s Trucking Company out of Smithfield, was Clifton Paul Ellis, Jr., 28, from Kenly. He told Raleigh police officers that he tried to move over but was unable to do so because of on-coming traffic. According to police officers, the collision resulted from Ellis’ failure to move over far enough to pass Jordan safely and slow his vehicle to avoid striking him from behind. Although it was indicated that the log truck was traveling only 35 mph in a 50 mph zone, the impact was enough to throw Jordan some 50 feet. Ellis has been charged with misdemeanor death by a motor vehicle and failure to reduce speed to avoid a collision. Steven Jordan had been with the mental health and substances abuse services in Raleigh, since 2010. Before that, he was with ResCare-North Carolina, where he worked with people who have disabilities and at-risk youth. Those that knew him said that he had a passion for cycling and commented that he died doing what he loved. When we hear of accidents like this, we are saddened by the loss of a son, husband, father, friend or colleague caused by the brief inattention or negligence of another individual. From a visibility standpoint, clearly the driver of the truck was in an elevated position with an unobstructed view of the traffic in front of him. The tragic results of this July 4, 2012 could have been avoided if the driver of the log truck had slowed down and moved over enough to safely pass the bicycle, or remained a safe distance behind it before passing. If you, a family member or a friend have sustained injuries or had to face the reality of losing a loved one while pursuing their hobby of cycling, you need to speak with an experienced North Carolina personal injury attorney. At Auger & Auger, our entire practice is focused on helping clients in Charlotte and throughout North Carolina, with a wide array of personal injury matters. With nearly 40 years of collective experience, we have garnered the respect of the judiciary and our peers for our commitment to the people we represent. 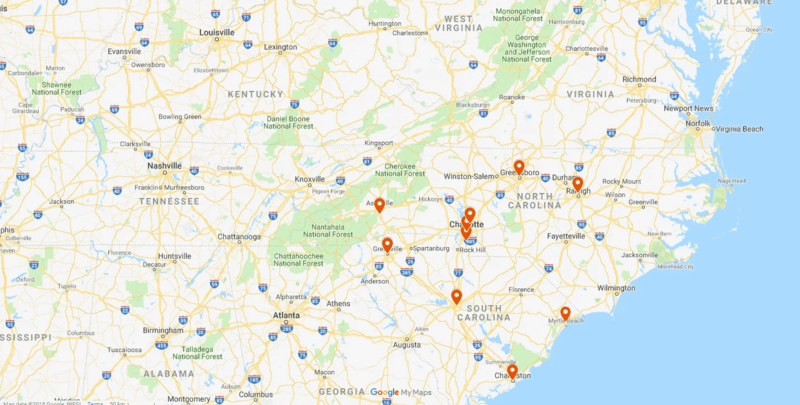 We have offices conveniently located for you in Charlotte, Greensboro, and Raleigh. Contact us now to set up your confidential, no obligation consultation with one of our attorneys. We handle cases on a contingency basis, which means you only owe us a fee if we recover a monetary award for you. Now that summer has officially arrived, our North Carolina workers’ compensation attorneys know how important it is for employers to take proper precautions for their employees who are forced to work outside in extreme heat and humidity. The North Carolina Department of Labor (NCDOL) is being proactive in its heat awareness campaign of 2012, after there were four documented heat related deaths on the job in 2011. According to NCDOL records, this was the first time that there had been any heat related deaths since 2006. Overall, North Carolina had an increase in workplace deaths as they rose from 50 in 2010 to 53 in 2011. Construction led all sectors with 16. North Carolina Labor Commissioner, Cherie Berry, warns that the extreme heat and humidity creates a dangerous mix for workers and asks that employers be aware of ways to avoid heat induced injuries. The NCDOL says that a major contributor to any heat related injury is dehydration. Various injuries can result from dehydration, such as heat cramps, heat exhaustion, a heat stroke or even death. It recommend that workers drink eight ounces of water every 15 minutes or so and warn that drinks containing caffeine or alcohol do not provide the hydration necessary to avoid injury. Employers can aid in the prevention of heat related injuries by starting and stopping work earlier, providing water coolers on all vehicles and keeping water on job sites. Regardless of the precautions taken, heat related injuries are bound to happen to people on construction sites who are exposed to the elements. An injury resulting from heat exposure is no different than other on the job injuries, as far as the North Carolina workers’ compensation law is concerned. All entitle an injured worker to medical benefits, weekly compensation benefits or fatal benefits to survivors. If you, a family member or a friend have suffered from a heat related injury or lost a loved one due to a heat related death, you need to seek the advice of an attorney experienced in handling North Carolina workers’ compensation cases. At Auger & Auger, our attorneys have nearly 40 years of experience handling a wide array of personal injury cases, including workers’ compensation. We can explain what your rights are under the North Carolina workers’ compensation law and answer any questions you have. For your convenience, we have three offices in Charlotte, as well as two others in Greensboro and Raleigh. Please contact us to schedule an appointment for a confidential, no obligation consultation with one of our attorneys to discuss your case. We handle cases on a contingency basis. This means that you do not owe our firm a fee unless we are able to recover money damages for you.